The TEEP structure is the best advice I received from an English writing professor, one that I still use today. The structure is especially great when one has writer’s block. ⇒ Topic Sentence: Tutor.com is an asset to nontraditional students around the country. ⇒ Explanation (Explain why or elaborate): Sometimes professors lecture at lighting speed force, which makes it harder for many students to keep up. ⇒ Example (Illustrate a personal or general example here or you can always explain further to substitute an example. Also, you have to cite your references. Most likely with MLA [Modern Language Association formatting]): That’s because they have to pick a median speed they feel works for all students (Hart, 6-7). Even still, this speed is too swift for many students like me. ⇒ The Point (Reinforces what you’ve written before it. It’s the “Frankly, why should I care? !” It is your thesis statement in the first paragraph): Tutor.com can bridge the gap for all lagging students. * The point––or thesis statement if it’s your first paragraph––lets your professor know what your essay will be about, the point you will be making throughout. Tutor.com is an asset to nontraditional students around the country. Sometimes professors lecture at lighting speed force, which makes it harder for many students to keep up. That’s because teachers have to pick a median speed they feel works for all students (Hart, 6-7)*. Even still, this speed is too swift for many students like me. Tutor.com can bridge the gap for all lagging students. ** Warning – Some professors loathe contractions like “that’s (that is),” “haven’t (have not),” “isn’t (is not),” etc., so get the ground rules beforehand. Note that “its” is not a contraction. It is a possessive pronoun that shows ownership. For example: The dog sat on its bed. If you are unsure of what your college professor wants, don’t use contractions at all. Why risk it? 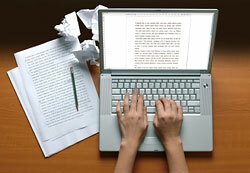 In-text citations add creditability to your college essays and research papers. It consists of the author’s last name of the book or article, and the page number, where you cited your information: (Hart, 6-7). As you can see, the citation should be in parenthesis at the end of the sentence or a body of text. Plus, with citations, you’ll need to back up any said claims in your essay paper–like when I was trying to prove that William Shakespeare’s writings were complicated to read, to not just me. Topic Sentence: Many students have read William Shakespeare’s work and acknowledge his contribution to the literary arts–a cosmic genius of sorts–but undoubtedly, several readers criticize that his writings are difficult to read. Explanation: In fact, he purposely complicated the English language to reveal a more poetic prose to mystify and captivate his audience. Example: Strange lines of text embedded his poems, which were often not complete sentences, or he switched words around that made the sentences grammatically deficient by any collegiate standards (Shakespeare, XVII). Doe, Jane M. “Title of an Article.” Title of a Magazine 12 Sept. 1995: 53. Public, John Q. “Title of an Article.” Title of a Scholarly Journal 24 (2004): 119-25. * MLA in text citation.